Seeing the pink banners emblazoned with the exhilarating text “Semi-Annual Sale” is always an adrenaline rush for women of all ages to travel en-masse to their local malls or gather around a computer monitor for an epic bargain event. Bins of bras in all colors and sizes fill shopping baskets as women root through the savings to find the best fit for their bodies and wallets. However, for homeless women who have difficulty affording rent and medication, the experience can be out of reach for many. I Support the Girls wanted to change that, and brought the exhilaration full-force earlier this month. Teaming up with Thrive DC, an organization providing services to the homeless in the heart of the District of Columbia, we helped put on the ultimate Spa Day for homeless and disadvantaged women on February 12th. On this exquisite day of relaxation and pampering before Valentine’s Day, volunteers partnering with Thrive DC provided massages, facials, manicures, makeovers (shout-out to Melissa from Beautiful World), and a warm meal to women (known as clients) in need. To enhance the spirit of Spa Day’s focus on improving the health and wellness, I Support the Girls provided the bras from months of mailed-in and dropped-off donations. Before the doors opened to the clients of Thrive DC, I worked with I Support the Girls founder Dana and other allies to set up. There were more boxes than hands to unpack them (numbering upwards of 40 overflowing containers) scrawled with Sharpie labels to designate size. Despite this, nothing could prepare me for the bonanza of bras, straps, and clasps that sprung out of overcrowded, yet expertly organized boxes. In a wave of color, lace, padding, wire, and straps, thousands of bras were laid out on tables for crowds of women to try on, much like that Victoria’s Secret semi-annual sale. Two experienced former Victoria’s Secret employees volunteered their skills to fit the women before they chose their bras. A majority of the women didn’t know their size, so they appreciated being properly and professionally measured. Having never been in one place with so many bras, it was a bit of sensory overload. There were pink bras, cheetah bras, training bras, nursing bras, neutral colors and frilly ones, but the kind most sought after by the women were comfortable, colorful sports bras. The purpose of I Support the Girls is to encourage a healthy lifestyle. Having a properly fitting bra is essential for a variety of health reasons, safety, and self-esteem. As women trickled out, they thanked the I Support the Girls volunteers profusely. Hugs were shared amongst all. 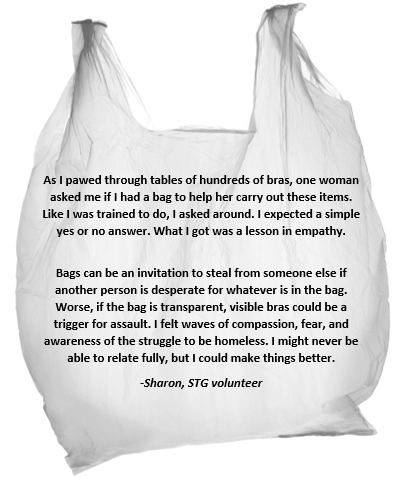 Some volunteers recognized bras they had donated on their way to a new wearer. 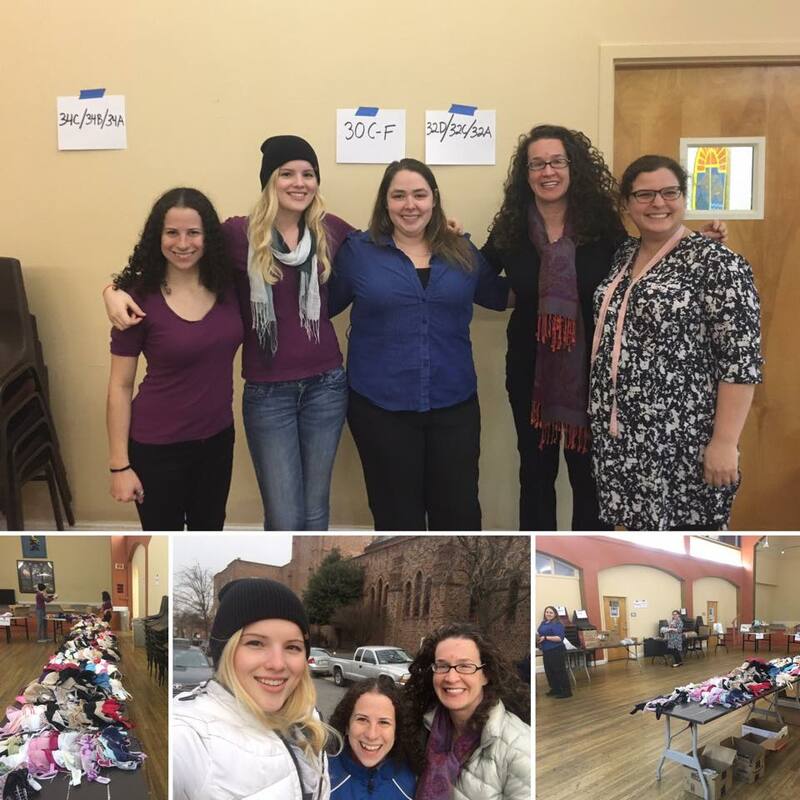 One volunteer remarked “Seeing my old bra reincarnated into a blessing for a woman in need was wonderful.” Spa Day was not only derived to give bras to those in need, but to celebrate a beautiful day of female fun and friendship. The next Spa Day will be around Mother’s Day, and we are actively collecting to fill up our now emptier boxes and give back to more women in need! Please consider a donation of a bra to help make the next Spa Day a resounding success. You’re bringing them up the right way!